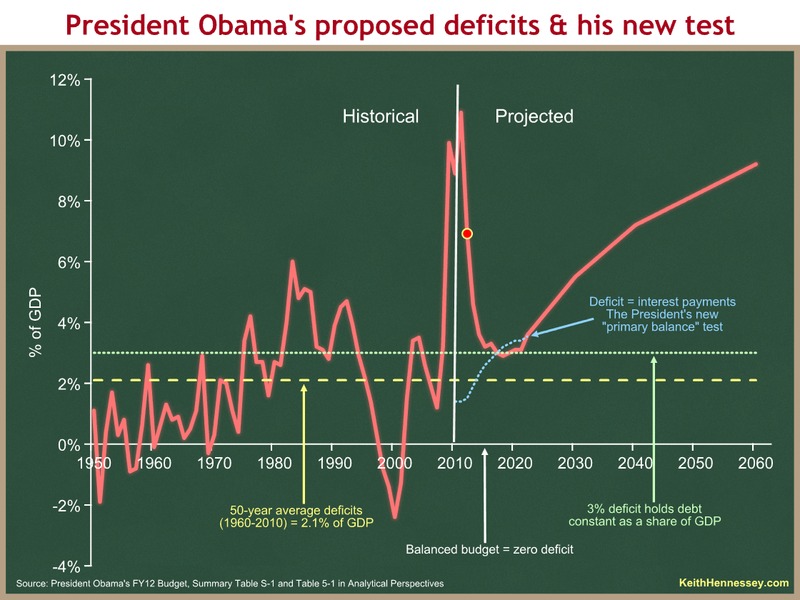 Today we’ll look at President Obama’s proposed deficit path, as yesterday we looked at his spending and revenue paths. The red line on this graph compares the last 50 years of deficits with the next 50 years under President Obama’s proposed policies. The vertical white line at 2011 separates the past from the projected future. This graph is busy because we have four different bases for comparison. The first three are standard metrics. The white x-axis would be a balanced budget. The dotted yellow line shows the 2.1 percent of GDP average deficit over the past 50 years. The dotted green line is at 3 percent. Above the dotted green line, debt will grow faster than our ability to pay it. The dotted blue line is the President’s proposed new test for himself and the country. He now defines success as getting red below dotted blue. The President proposes a 7 percent budget deficit for 2012 (the red dot). His deficits would bottom out at 2.9% seven years from now, in 2018, and then rise steadily forever. The President proposes deficits that are in each year well above the historic average (dotted yellow line). Until 2015, our debt/GDP ratio will increase every year. For a few years beginning in 2015, the President’s budget would stabilize debt as a share of the economy. You can see our severe problem in the large, sustained deficits that are projected to grow forever, beginning a few years from now. We used to call this a long term problem. Current short term deficits are high enough to be economically damaging. That long term deficit path is unsustainable. Something will break. The President’s budget doesn’t even pretend to shoot for balance, or to reduce deficits to the historic average. He has abandoned those goals, and instead draws a new dotted blue line that grows rapidly over time, and then defines success as getting deficits below that. Here is the President in a press conference Tuesday. Our budget … puts us on a path to pay for what we spend by the middle of the decade. … by the middle of this decade our annual spending will match our annual revenues. We will not be adding more to the national debt. So, to use a — sort of an analogy that families are familiar with, we’re not going to be running up the credit card any more. The President’s credit card analogy is a good one. Anyone with a mortgage or a credit card balance knows that you have to make monthly interest payments. Those interest payments don’t get you any new stuff, they just pay for the past borrowing you have done. (Technically, they are paying for the service of the loan you have been provided.) If you stop using your credit card, you still have to make interest payments on your outstanding balance. In the same way, a portion of your monthly mortgage payment is interest on the loan you used to buy your house. The same is true for the government. In 2012, $240 billion of next year’s $3.7 trillion of federal spending is for interest payments on accumulated federal debt. The President wants to take that amount out of the deficit calculation, and define success as paying only for new spending. He wants to ignore interest payments when calculating the deficit. The President is trying to politically redefine deficit to mean only the gap between the red and dotted blue lines, rather than the gap between the red line and the x-axis. Once he gets red down to dotted blue, he would say he has balanced the primary budget, meaning that all revenues in that year will equal all spending except interest payments. Boring interest payments don’t pay for fun new high speed choo choos, but we still have to make them. In 2017, the Treasury would still have to borrow $627 billion from financial markets just to raise the cash to make interest payments. Our unified deficit would still be 3% of GDP. Our $627 billion unified deficit would still exceed the historic average of 2.1% of GDP. I had originally thought the President was just trying to lower the bar, to obfuscate his proposed enormous deficits by trying to redefine the word “deficit” in a way that few would understand. Now I worry about a deeper rationale. Maybe the President actually thinks it’s not his job to make the hard choices to pay for the interest costs of debt accumulated before he took office. Is he arguing that his job is not to solve the challenges our Nation faces, but instead only to get to a point (seven years from now) where his actions don’t make things even worse? I had always thought his “inherited” meme was simply a political tactic – blame your predecessor for everything bad so you look good in comparison. That’s tawdry but hey, politics can be a rough game. Now I worry that he might actually believe it. Our accumulated debt is now 62% of one year’s GDP, up from about 40% when the President took office. By defining primary balance as his goal, is President Obama saying that he’s not responsible for proposing policies to pay for the interest costs on that debt, one third of which was accumulated on his watch?